Our bodies are more than 60% water, so it’s no wonder that dehydration can have serious effects on our health. Drinking enough water throughout the day is essential to keeping our cells, tissues, and organs functioning properly. The problem for most people is determining how much is “enough” water for their own bodies – the answer differs from person to person, and can even differ from day to day, depending on your lifestyle, eating habits, and environment. Because the effects of dehydration come in so many different forms and symptoms, it’s important to understand how to recognize dehydration, and how to keep your body hydrated in various situations. Dehydration occurs when your body loses more water than it’s taking in, and the fluids in your body become unbalanced. On an average day, we lose between two and three liters of water through breathing, sweating, and excreting. Throughout the day, we replace much of what we lose by drinking water (and other beverages); keeping our bodies in a happy balance. While most of the time, your own feelings of thirst will guide you in keeping hydrated, there are some circumstances in which your body tends to lose more water than you can naturally replace – for instance, in very hot temperatures, times of sickness, and during exercise. When your body doesn’t receive enough water, your blood pressure will drop, and your heart rate will increase – depriving your cells of the water they need for all systems to function properly. As a result, you will start to experience dehydration. When you are dehydrated, your systems are strained and your blood circulation is lowered. You may experience muscle cramps, constipation, or dizziness. Your blood pressure drops, which can make you lethargic; simple tasks may become extremely physically tiring. Dehydration reduces the blood flowing to your skin, which can make you feel cold, as your body struggles to regulate its own temperature. Some people, when chronically dehydrated, may even notice sudden weight loss. If you become dehydrated while exercising or doing high physical activity, your body will start using up your stored carbohydrates much faster. As a result, you may feel cravings for sugar – your body’s way of signaling that you need to replace those stores of carbohydrates – even though what you really need is water. Bad breath is a lesser-known indicator of dehydration, caused by the decreased saliva in your mouth. Dehydration also has neurological effects; you may become cranky, lose focus, or experience headaches. The symptoms of dehydration can be as simple as a dry mouth, cool skin, or headaches; but more debilitating symptoms like fatigue, or fluctuations in mood and memory, can have a severe impact on your ability to function. The key to preventing dehydration is drinking plenty of water (shoot for about 1.5 liters per day), to sufficiently replenish the water your body naturally loses. Try to take a drink of water when you start to feel thirsty, instead of waiting until you are very thirsty – extreme thirst is a sign that dehydration has already begun to take effect. If you are engaging in prolonged exercise, feeling under the weather, or are exposed to high temperatures, it’s important to be extra conscious of your level of hydration. Drink more water than usual in these circumstances, even if you don’t feel extra thirst. 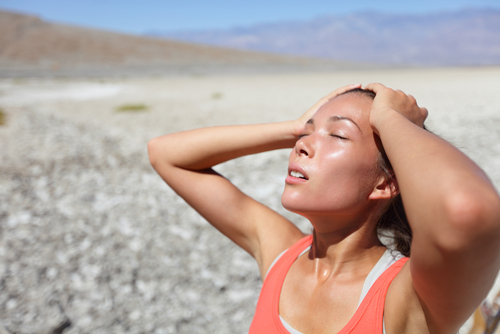 When you start to sweat excessively and lose sodium, you will notice a craving for something to quench your thirst. To replenish yourself, opt for a beverage that is packed with electrolytes like coconut water; stay away from sugary drinks, or drinks with caffeine in them. These beverages will actually reverse the process and pull water away from the body. Staying hydrated helps balance our brain, organs, and hormones. Without adequate water, our bodies can’t function at optimal condition, and we suffer from both physical and mental effects. While some symptoms may seem mild, extreme dehydration can require hospitalization, and can even be fatal. It’s essential to be in sync with your body, so you can recognize the signs of dehydration in yourself, and remedy it promptly. Understanding how dehydration occurs, and how it affects your body will help you to monitor your own water intake, and take extra precautions in situations where you know you’ll lose water more rapidly. This entry was posted in News and tagged dehydration, Health. Bookmark the permalink.